I read 22 debut novels this year, which is more than I would have guessed. It's fun to discover new authors just as their books are coming out and to be part of the excitement that comes from that first publication. We also love participating in That Artsy Reader Girl's Debut Author Challenge. 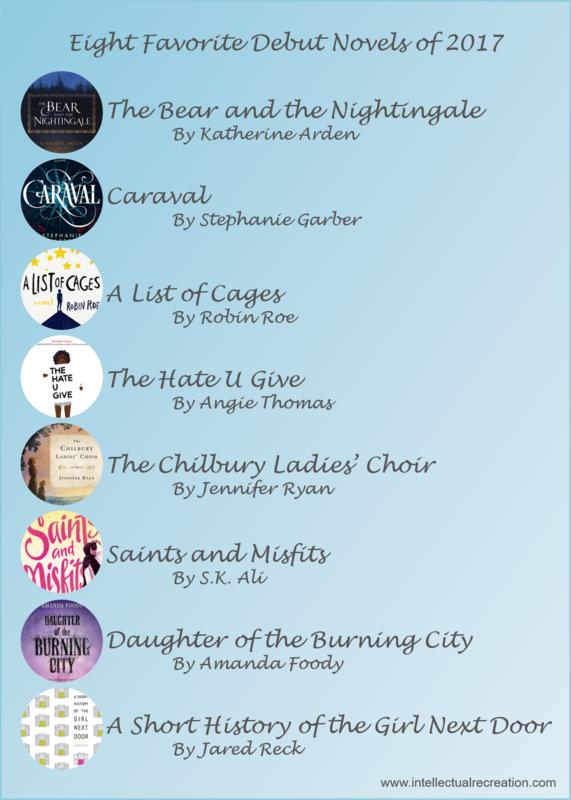 A big congratulations to all the first-time authors we were able to feature on Intellectual Recreation this year! Here are some of my favorites. After five years, Adam reconnects with his former foster brother, Julian. This story just about wrecked me. Be prepared to have to have lots of feelings. This is the debut everyone has been talking about. Inspired by the Black Lives Matter movement, Angie Thomas really delivered with this heartbreaking and provocative debut. The story of Matt and his best friend and secret crush took a turn that I did not see coming. I don't want to spoil it. Don't read any reviews. Just read it.